Access to a full range of software, applications and other digital resources is an issue of critical importance for any business. Assuming that the hands on nature of landscaping work means your business can do without technology is a misstep that could end up costing your business a great deal. From powerful design programs to feature-rich mobile apps the following list showcases some of the many apps and programs that landscaping business owners would do well to consider. While design software is rarely needed to provide routine lawn care, being able to easily plan out and design a major landscaping renovation or other large-scale project can be a helpful tool. AutoCAD software offers a number of powerful design features, such as 3D Visualization and detailed in-depth 2D layout design tools that have made it an industry standard for years. AutoCAD can work with a range of different platforms ensuring that landscaping businesses can more easily incorporate it into their digital infrastructure and workflow process. Being able to design, plan and prepare can help you make quick work of even the most ambitious landscaping jobs. While AutoCAD may be both powerful and flexible, it was not created specifically for landscapers. First developed in 1994, PRO Landscape offers a full range of range of features that have been created just for landscaping. This software is ideal for incorporating photo images into any plans or designs to help clients visualize the end product while you win more jobs. PRO Landscape also offers a companion app, suitable for use on mobile devices which can help to ensure that all work crews and field professionals are able to access the data and information they need. While conventional desktop software offers some of the most robust performance and powerful design features, having to lug a laptop computer from job site to job site may quickly become a problem. 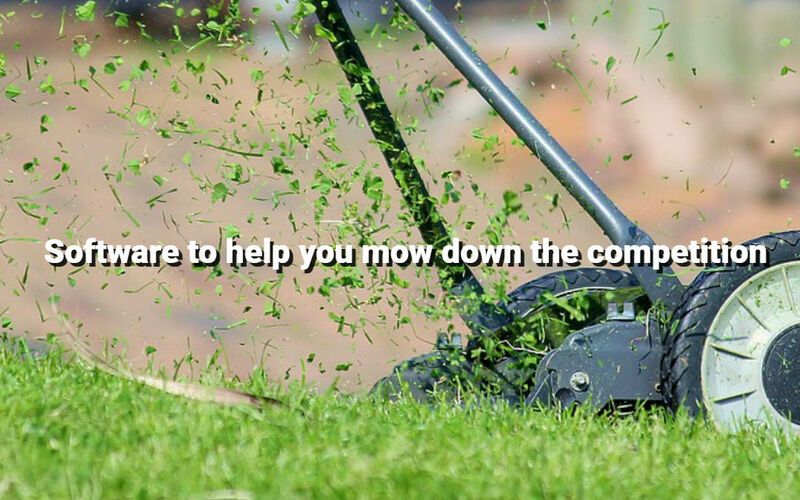 There are plenty of Android apps, like Lawn Care Pro which were created specifically for lawn care and landscaping service providers. Being able to plan and visualize all aspects of a landscaping upgrade from the jobsite can provide a number of advantages that landscapers cannot afford to pass up. Using a mobile app designed to run on a smartphone or tablet rather than investing in a more expensive laptop system can also allow business owners to reduce their overhead and operational costs. Business owners may require mobile apps that are capable of a whole lot more than just designing an exterior space or planning the perfect landscaping upgrade. Apps like Square which can turn a smartphone or tablet into a mobile point-of-sale device are ideal for lawn and landscaping businesses whose customer interactions typically occur in the field. Even WeatherBug which offers access to current weather forecasts and conditions may help to ensure that work crews are better able to avoid the potential disruptions and complications that inclement weather may cause. Another invaluable app for landscapers is JobFLEX, an Android app designed to assist businesses with generating and managing quotes and invoices. Rather than a messy system of handwritten quotes and estimates, JobFLEX allows landscapers to upload price lists and create accurate, professional looking quotes in seconds. Once a job has been finished all it takes is a few taps on your mobile device to turn an estimate into an invoice and send it to your customer to ensure a quick payment. The tool is straightforward, easy to use, and can help landscapers win more jobs and get paid more quickly. Try a free trial of JobFLEX today and see for yourself. Every business has different needs which may require a variety of digital resources. Business owners would do well to take stock of their current situation, infrastructure and outline their most pressing business needs before picking out and paying for any new landscaping software or apps. But once you’ve done your homework, making an educated decision can make your business run much more smoothly.